You have to love the spring as the temperatures go up. In particular, It gives you an excuse to drink cooling libations like a Cuba Libre. However, she Who Must Be Obeyed says I am all the reason she needs to drink. The recipe for this drink is at the end of the post. 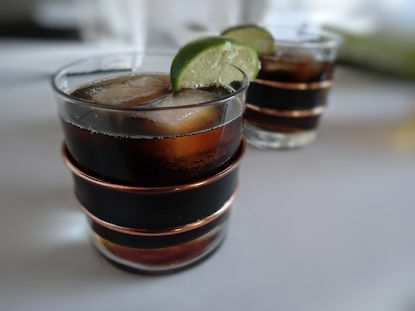 Most people think a Cuba Libre is a rum and coke with a wedge of lime. Sigh. There is a little more to it than that. In my opinion, a Cuba Libre is two parts of cola to one part of rum. The high ratio of rum means you need to use a quality rum. Also, it has to be a good amber or dark rum. The rum needs to be a major flavour in the Cuba Libre and white rum just doesn’t have the flavour. As for the lime, you need a good note of lime to give it that refreshing astringency so forget just squeezing a lime wedge in. You need to add some lemon juice to the drink and give a lime wedge to get the right amount of lime taste. The last key ingredient, ice cubes. This drink must be icy cold. Use at least 3 ice cubes. 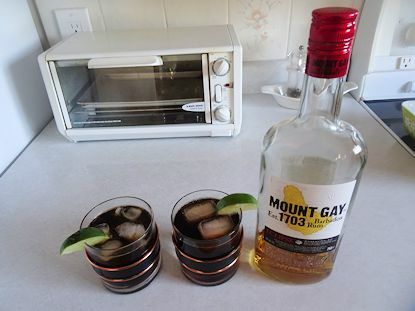 This is an easy drink that gives a good rum and lime flavour that can stand up to the cola. It quenches thirst, tastes great and can make She Who Must Be Obeyed friendlier in sufficient quantities. Perfect! Put the ice in a large highball glass. Pour the cola, rum and lime juice into the ice and stir with a swizzle stick. Garnish with wedge of lime. I am loving this blog and am so glad you commented on mine since it led me to discovering yours. I love the layout, photos, recipes, your blog voice – it’s all awesome! I’m definitely going to be following it. “She Who Must Be Obeyed”, I giggled pretty hard at that. I’m going to have to make myself one of these drinks! Sounds delicious. Thanks so much for the kind words, Dana. However, I never giggle at She Who Must Be Obeyed (the reason we’be been married 40 years). I have to say I was impressed with your site. I particularly like your photography. I wish I had your eye. Gosh, thank you so much! The photography is just a result of a lot of perseverance and browsing through food photography online. When I look at the photos of my food from two years ago, when I started my blog, I cringe. Haha. Ah, maybe there is hope for me then! You can’t beat a cold rum drink on a hot day, Sam. I’ll start mixing one.